No, it’s not a brand of rum. Bokhari, Rana Bokhari, is the new leader of the Manitoba Liberal Party. This is an interesting development, and I think it’s great news for not just the Liberal party but for Manitoba politics in general. Rana represents the best chance of the Liberal party to reinvent and rejuvenate itself, and Manitoba needs a strong Liberal party for a healthy democratic environment. Bokhari has a fresh perspective, having only been a party member for five years, and seems to recognize the importance of rebuilding the party. By contrast, had Bob Axworthy won — a man who joined the Liberal party a decade before Bokhari was born, and indicated at times that he supported the NDP’s sales tax increase — the party was sure to have gone nowhere and inspired nobody. The other contender, Dougald Lamont, might have injected some new ideas and energy into the party, but doesn’t come across as a bold change from the status quo. A recharged Liberal party would be bad news for the NDP, because the Liberals and the NDP tend to share the same voter pool, whereas the PC vote is less related to either party. 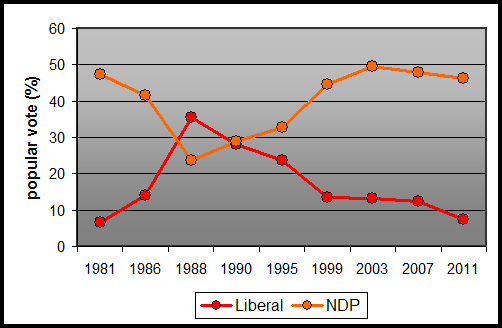 In others words, an increased Liberal vote means a decreased NDP vote. Can the Manitoba Liberal party regain the public’s interest? Recent polls are hopeful but perhaps not to be trusted. However it has been done before: the party came off a historic low in 1981 with less than 7% of the vote to rise to official opposition in two election cycles with over 35% of the vote. In an ideal world people would vote based on policy and integrity, but in the real world many people vote based on gender and race and other demographic factors, as well as personality and charisma. I don’t have a good handle on Rana’s charisma yet, but I do have a good read on the outgoing leader’s charisma and I don’t think I’m going out on a limb by saying that Bokhari will be a more captivating personality than Dr. Gerrard. Then there are demographics: this is the element that will really add an interesting dynamic to the next provincial election. Bokhari is young, a first generation Canadian of ethnicity, and female. All three of these factors could boost voter turnout in the next election, but they could also increase the migration of X’s from NDP box to the Liberal box at the voting booth. The NDP is stronger with females than with males, whereas the PC party is more dominant with males. If a female party leader attracts female votes, it stands to reason that more of these votes will come from the NDP. Similarly, if Bokhari appeals to voters of similar ethic and cultural backgrounds, that will tend to hurt the NDP because most of those voters live in Winnipeg where the NDP is strongest. The youth aspect is a little less straight forward because both the PCs and NDP are stronger with older voters whereas the Liberals are already more popular with the young folks — if it’s okay to call young people “folks” — according to recent numbers that I saw. We’ve seen relatively young majors elected in Edmonton and Calgary. Maybe it’s a bit of a stretch, but this indication that urban voters are comfortable with a 30-something leader might mean that more of the NDP’s Winnipeg base will be eroded by the Liberals. No doubt there will be numerous polls looking at these things, and this will be interesting to follow, but the real question is: can Bokhari duplicate Sharon Carstairs’ feat of pulling the party back from the brink of irrelevance? “She has an incredible ability to connect with people” said a friend of Bokhari’s. Let’s hope so. She’ll need it. A tip for Rana: if you want to connect with people, get more personal with your Twitter account. I normally follow the party leaders on Twitter but I haven’t bothered following Rana yet because she has posted very little worth reading. In fact, most of what is there is posted on behalf of Rana rather than by Rana herself. You know who else does that? Barack Obama. Even His Holiness the Dalai Lama gets more personal on twitter than Rana. Engage the people with actual discussion, random whimsical thoughts or even Hallowe’en costume ideas. Anything to get people to relate to you and feel as if they are getting to know you. “I had such a great time at our fun and successful fundraiser tonight!” won’t do it.